If a person is not innovative with self, can she be innovative in an organization? The process of innovation is full of highs and lows and requires people to stretch themselves beyond their comfort zone so I think it depends on a person’s tolerance for failure. It basically comes down to mindset, Carol Dweck has written extensively about how there are people with a fixed and growth mindsets. If you look around you’ll see that we’re mostly surrounded by people with fixed mindsets, people who are afraid to be wrong and make mistakes. Where innovation requires a learning disposition, people with fixed mindsets have a hard time accepting the idea that ‘failure as learning’ is part of the process. What we need to do is come to a collective understanding that failure will happen along the journey of any new initiative and see it as an investment, this way we can change the perception of failure from ‘failing to learning’. P.S Be sure to click on the links (do you have a growth or fixed mindset? ), it’s stuff I’ve written about before as well as ideas taken from elsewhere but they all come back to the growth vs fixed mindset. Do companies need less innovation? This is a guest post by Ralph Ohr in response to an article posted on Business Week titled: Why Companies Need Less Innovation. Although, I just partly agree with the author, the post has greatly initiated an important discussion. The definition of what innovation means in a certain context as well as the resulting question who is responsible to drive the defined scope, turn out to be crucial for innovation success. As already indicated in former comments, the author tends in his understanding of innovation to focus on the more radical part of the continuum. This part is primarily driven top-down, requires dedicated processes in place and depends on the allocation of selected resources. Leadership needs to assure these pre-conditions, together with a proper link between company’s strategy and innovation. Otherwise, aligned activities and targeted resource management is likely to fail. Arie Goldshlager has well pointed out that an innovation chain is likely to be just as strong as its weakest link. He pinpoints the importance of improvements for incremental innovation. Improvements typically emerge from daily business and are driven bottom-up by employees in their respective field besides doing their day-to-day job. This is particularly important as incremental innovation usually accounts for the majority of activities to the overall innovation portfolio. In this sense, everybody in a company is basically in charge to contribute to the development of the company in order to stay competitive – closeness to daily business and time horizon might be different. If we consider innovation to cover a continuum, ranging from incremental to radical purpose, it’s essential that leaders understand that both end of this continuum require different approaches, incl. objectives, mindset, resources and processes. I don’t think companies need less innovation – I rather think, companies should focus on contributing to innovation at the right point of the continuum. Competition in industries is essentially competition between business models. A recent tweet by @TimKastelle, which led to a post about the evolution of the business model concept, reminded me of a great creative exercise to help you look at your and other industry’s dominant business model as a lego kit. Tagged business model, business model innovation, Creativity, Game mechanics, Innovation. 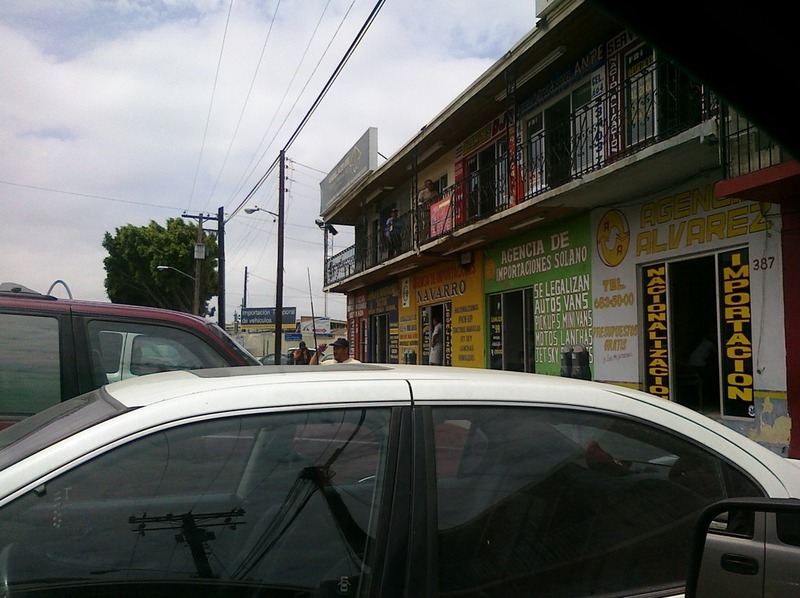 These pictures are from the border crossing between San Ysidro and Tijuana. 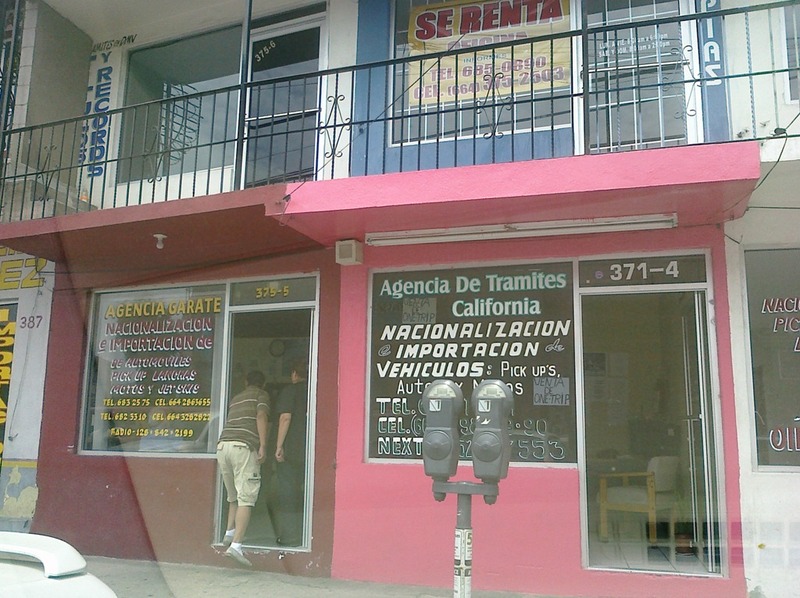 This is Tijuana a few steps after you cross the border and this building is full of auto import agencies. There’s 18 of them and they all sell the same stuff, advertise the same way, operate the same way and talk the same way. The only recognizable difference between them is the name of their business, the font they use and the colors. Is that all there is? I imagine anybody who comes through here must think the same thing: Which one do I…what?! To prove my point I sat at a table across the street for a couple of hours and went to work to see how many people ‘cared’ to come in. Afterwards I went in and acted as if I were looking to import my own car, I only visited 6 of them but that was enough: My conclusion is: how are these people in business? This is a textbook example of having no distinct point of view. When you have the same point of view as everybody else, everything you do and say is going to be like the guy next to you. Sure any of these businesses can try a handful of marketing tactics to get people to walk through their doors but any smart customer will look around and see that the only noticeable difference between the ‘offers’ is price. Hence these businesses are locked-in a lowest bidder businesses. Where’s the real value? An authentic way to stand out is to have a point of view since most folks stand for nothing more than the same. So if the guy next to you has a ‘boring point of view’ that’s you cue! Great collection of reads this week which I encourage you to read while also following these smart people on Twitter. Tagged business model, change, disruption, Economics, failure, ideas, Innovation, Leadership. To change things up a little bit I decided to take a taxi after I crossed the border to Mexico today. After you cross the border and walked over to the cab station you’ll notice there are two types of cabs, the yellow ones which are the least cheap and the ‘taxi libre’ which takes you anywhere you want for less money than the yellow taxi. But surprise-surprise, I got on a taxi libre and soon found out that there’s a third type of cab and that I was in it. Me: So what’s the damn difference between this taxi and all the other ones that look just like it? Me: And how are people supposed to know which one is which? Driver: After we’ve taken them where they want to go. Are you kidding me?! Seriously that was one of the stupidest things I’ve ever heard. Nowhere on the cabs is it mentioned that there are two ‘taxi libre’ types of cabs, you really don’t know only after you get on a cab and ask for a price. It’s safe to say that if you’re a foreigner you’re paying a lot of money for a cab and I have no doubt that is why this exists. I’ve taken a lot of cabs down here but this is the first time I’ve encountered this, I mean I was surprised at this nonsense! I ended up telling the driver to drop me off immediately and went back to where the taxis are stationed. Once there I started asking around which ones were the non-economical taxis, that got some of the drivers really angry because it was as if I’ve just crashed their party. They had no other option than to offer me the normal rate. Because it just goes to show what happens when you change your routines. If you always stick to the same path, the same way of doing things, you’re missing out on other possible paths. If I hadn’t changed my routine today I wouldn’t been able to tell my foreign friends and readers to watch out for those ‘taxi libre’ cabs the next time they come visit Tijuana! Give it a try. Instead of driving to work like usual, take the bus. There’s nothing like seeing things up close and personal.